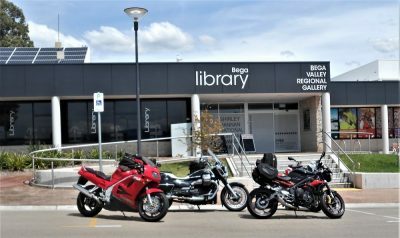 Motorbike library-tour group Biblio Turismo has visited Bega library as part of its annual tour of New South Wales libraries, reports Bega District News. Between 8-11 November the group visited libraries in the towns of Gundagai, Tumut, Cooma, Bega, Bombala and Tura Beach. The group began in 2006 as a way for rural motorbike-riding librarians to network with each other and has become an opportunity for rural libraries to publicise their services. This year’s tour was nostalgic for Flores, because he was the first librarian for the Bega Valley Shire, after helping to set up the original library service in 1975. See more about the tour on the Biblio Turismo’s blog.